An eye exam may show signs of increased pressure in the brain, including swelling of the optic nerve or bleeding into the retina of the eye. A brain and nervous system exam may show abnormal eye movement, speech, strength, or sensation. Your provider will help you decide whether or not it is safer to have surgery to block off the aneurysm before it can break open. Sometimes people are too ill to have surgery, or it may be too dangerous to treat the aneurysm because of its location. 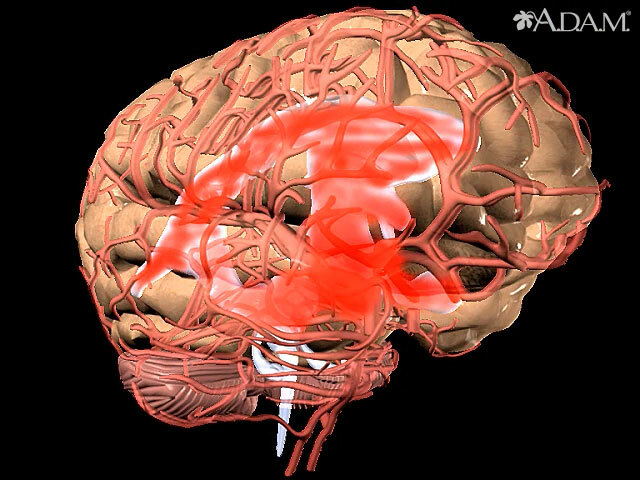 Ruptured cerebral aneurysms are often deadly. Of those who survive, very few have some sort of permanent disability. If unruptured aneurysms are discovered in time, they can be treated before causing problems. Bowles E. Cerebral aneurysm and aneurysmal subarachnoid hemorrhage. Nursing Standard. 2014;28(34):52-59. journals.rcni.com/nursing-standard/cerebral-aneurysm-and-aneurysmal-subarachnoid-haemorrhage-ns2014.04.28.34.52.e8694. Accessed July 19, 2016. National Institute of Neurological Disorders and Stroke. Cerebral aneurysms fact sheet. Updated December 20, 2016. www.ninds.nih.gov/Disorders/Patient-Caregiver-Education/Fact-Sheets/Cerebral-Aneurysms-Fact-Sheet. Accessed June 12, 2017. Thompson BG, Brown RD, Amin-Hanjani S, et al. Guidelines for the management of patients with unruptured intracranial aneurysms: a guideline for healthcare professionals from the American Heart Association/American Stroke Association. Stroke. 2015:46(8):2368-2400. PMID: 26089327 www.ncbi.nlm.nih.gov/pubmed/26089327. Reviewed By: Amit M. Shelat, DO, FACP, Attending Neurologist and Assistant Professor of Clinical Neurology, SUNY Stony Brook, School of Medicine, Stony Brook, NY. Review provided by VeriMed Healthcare Network. Also reviewed by David Zieve, MD, MHA, Isla Ogilvie, PhD, and the A.D.A.M. Editorial team. Editorial update 06/12/2017.